Posted by Dave Emory ⋅ November 21, 2017Post a comment Email This Post Print This Post Tweet This! COMMENT: Over the years, we have noted peoples’ reluctance and/or inability to adjust their views and perspectives in light of new information that would mandate such a correction. 1. The Brothers: John Foster Dulles, Allen Dulles, and Their Secret World War by Stephen Kinzer; St. Martin’s Griffin [SC]; Copyright 2013 by Stephen Kinzer; ISBN 978-0-8050-9497-9; p. 327.
. . . . Americans were only a few years past the trauma of World War II, which taught them the horrors of global conflict. Urged on by Foster, Allen, and others in Washington and beyond, they projected the crimes of their World War II enemies onto the Soviet Union. Since Japan had attacked the United States without warning, they presumed the Soviets were liable to do the same; Hitler had used negotiation as a tactic to give him room for war, they scorned diplomacy. . . .
2. 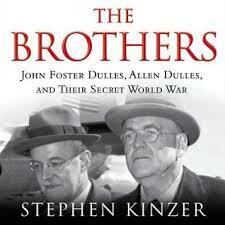 The Brothers: John Foster Dulles, Allen Dulles, and Their Secret World War by Stephen Kinzer; St. Martin’s Griffin [SC]; Copyright 2013 by Stephen Kinzer; ISBN 978-0-8050-9497-9; pp.320-321.